Frustrated with behaviors? Need some guidance?Last month my principal asked me to put together a presentation to help general Ed teachers at my school manage and deal with behaviors in their classrooms. I could easily spend an entire day presenting on behaviors, but I was only given 1 hour to present! 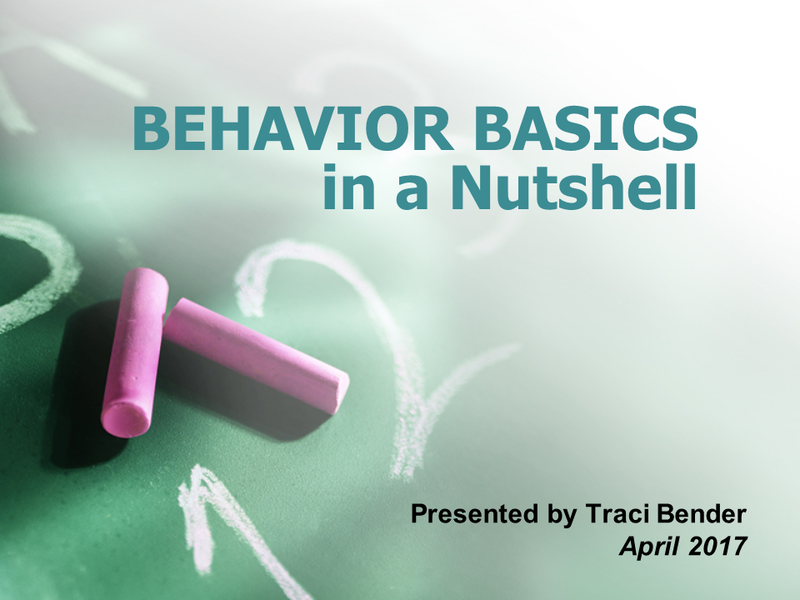 So I put together the most important tips and strategies that would be the most helpful for teachers into what I call, "Behavior Basics in a Nutshell." I'm sharing it here today as I know that many of you will also appreciate and benefit from this information. There's also a link at the end where you can download the presentation and share with your staff. I have left the 504 plans and RTI behavior referral process slides out of this post as this will look different at each school. You can download the A-B-C Chart here! I cannot say it enough, finding the FUNCTION is SOOOO crucial! I so often see teachers "feeding the behavior," because they don't know the function! For instance, if we have a child that is misbehaving to avoid completing his work and we place him in a timeout each time, we have given him what he wants. He got out of doing his work and not only is he happy now, he will engage in this behavior every day now when he wants to get out of doing his work. You can view the video link above here. These are just a few of the most commonly used, but not limited to. Another common mistake I see frequently. Sometimes you have to pick your own battles. If they're not hurting anyone or anything, Ignore it! Provide positive reinforcement to the students that are behaving. This is especially important if the function of their behavior is to seek attention like the video we watched. Also, reinforcement needs to be given immediately, even if it's a token, a high five, or a skittle, to prolong that BIG reinforcer! I too often hear teachers when I ask how they're reinforcing the student for good behavior say, "If they behave or complete their work all week I give them a prize on Friday." NOOO! This doesn't work! Find out what the student likes and only allow it contingent upon good behavior! I don't have a strict "no toys allowed at school" policy. I actually like it when my students bring toys to school. The minute they arrive, I immediately take the toy and use it as a reinforcer that day. Be careful not to bribe. Bribery is when a student is already engaging in an inappropriate behavior and you say, "If you stop doing this, I'll give you this." Consistency and strong classroom management is KEY! Sometimes, even though not natural for teachers to do, you have to set academics aside and focus on the behavior alone! You can download the point sheet that some of my students use in specials (art, PE, music, library) here. You can read more about self-monitoring and download the self-monitoring tools I most frequently use in my classroom here. Baby steps! Most of these children experiencing behaviors in our classrooms live in a punitive and negative world. We must provide set them up for success! You can download this presentation here. Feel free to share with your staff and fellow teachers as well. As I said in the beginning of this post, I could spend an entire day, probably even two days discussing behavioral practices in the classroom! While this is only a brief overview, I hope you found these Behavior Basics helpful! Feel free to post any questions you may have about these tips and strategies in the comments and I can provide you with more direction! If you're looking for more in depth behavioral support, I offer a comprehensive behavioral toolbox here that provides detailed step-by-step information on each of these slides and is packed full of token boards, charts, and everything you'll need to get you started with shaping behaviors in your classroom! And BTW, Happy Teacher Appreciation Week! Scroll down to my next post and enter the Teacher Appreciation Giveaway!